Carnegie Hero #10,001 Jimmy Rhodes, pictured next to Karen Mahany, widow of Patrick E. Mahany, Jr., the man rescued by Rhodes. 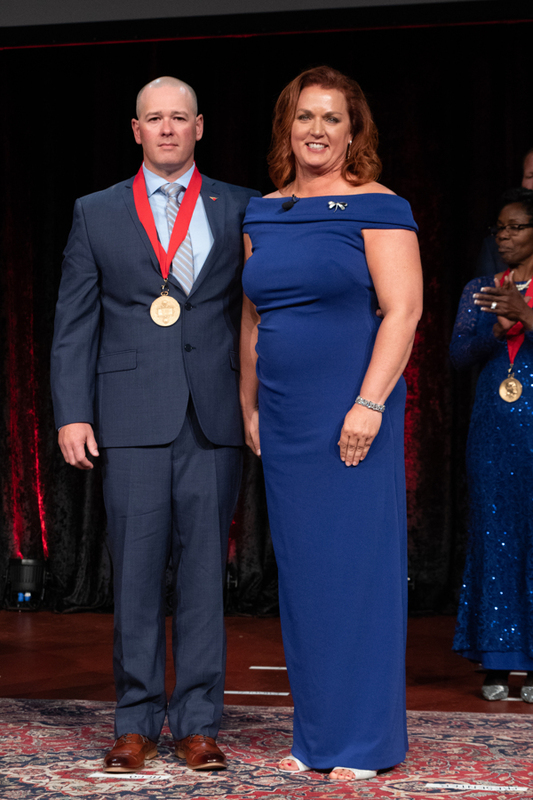 Mahany presented the Carnegie Medal to Rhodes at the June 12, 2018, Power of One event in Pittsburgh. The summer 2018 issue of imPULSE brims with stories of the 10,000th and 10,001st Carnegie Medal awards, covering the rescuers, their rescues, and the joyful ceremony at which Vickie Tillman and Jimmy Rhodes received their medals as representatives of all Carnegie heroes, past and future. Instead of rehashing what my colleagues have covered so well, I’d like to discuss a question — two questions, really — that might have occurred to you after you read these articles. First, why do we award medals for unsuccessful rescues? That is, cases where the victim died despite the valiant and risky efforts of the rescuer. Second, did an unsuccessful rescuer provide any benefit to the deceased victim? Was the effort, however risky, totally fruitless? These are important questions, ones that go to the very nature of the Carnegie Medal and to our human nature. The first question, “Why do we award medals for unsuccessful rescues?” is the one that speaks to the nature of the award. We don’t award the Carnegie Medal for physical prowess or competency in rescue technique. Remember, our rules that focus on altruism would exclude the part of the population most expert at rescues, such as lifeguards or firefighters. To qualify, a rescuer must act without any responsibility to do so. It has to be a free choice. Happily, our first responders are highly trained in rescues, but it is what they are paid to do, and in many cases they have even taken an oath to “protect and defend.” As a result, many of our most technically competent rescues won’t routinely receive the medal. The more important factor, though, is what the Carnegie Medal does seek to recognize: a dangerous moral choice, carried into action, to rescue another. The awarding rules focus heavily on choice. For example, a rescuer must “leave a place of safety” to qualify? Why? If you are already, and accidentally, in peril yourself, then you take no moral action deciding to rescue yourself and others. Consider the inspiring case of Capt. Sully Sullenberger. As he himself pointed out in public, he never made a decision to get involved in that situation to rescue anyone. When the engines failed with him aboard, the decision was made for him. He proved himself both unflappable and a superb airman. On top of that, his comment on the situation showed great moral insight. He might be my favorite non-awardee of the Carnegie Medal! This is a perfect illustration of how the award focused on the decision to act, rather than the technical competency of the act. In the best case the rescue succeeds, but what if it doesn’t? What did the rescuer accomplish for the risk taken? Quite a lot, according to a beautiful insight from my Hero Fund colleague Sybil Veeder. Veeder points out how important it is that the victim did not die alone. Faced with sudden, lonely, and unlovely death, the victim realizes that, no, they are not alone. They die, but they die knowing that another human, the rescuer, so valued them that the rescuer would share the very peril about to claim the victim’s life. This is a gift, a mitzvah, of great value, often delivered at great cost. It was clear what hero #10,000 Vickie Tillman did for police Cpl. Billy Aime when she helped him fight off a crazed attacker. Aime survived to present the Carnegie Medal to her. But what hero #10,001 Jimmy Rhodes did was equally lovely also, because as medivac pilot Patrick Mahany died, he knew he was not alone, that a stranger was willing to walk into fire to save him. Tillman and Rhodes illustrate what we owe our fellow citizens. No one asks that we be superheroes, pararescue jumpers, lifeguards. What Tillman, Rhodes, and all of our other heroes did was recognize the peril to another human being and put everything they had on the line to help. Bless them all, the 9,999 standing behind Tillman and the next 9,999 standing yet ahead of Rhodes.